Since we'd been out fairly late the night before, we didn't set an alarm for the morning, which meant we ended up waking up at around half nine and having a wonderfully lazy morning in the apartment before walking to Piazza del Duomo at midday to buy tickets for the sight-seeing bus, much like the open-top buses we see in cities like London and Cambridge. The tickets were €15 each, and luckily there was a bus already waiting by the time we got to the stop, so we jumped on straight away. The journey lasted about two hours, and took us all the way up to Aci Castello and back, with a couple of stops along the way. We passed by a lot of interesting sights along the way, starting in Piazza del Duomo where there are lots of beautiful buildings, some built from pale stone and others from charcoal-black lava stone. 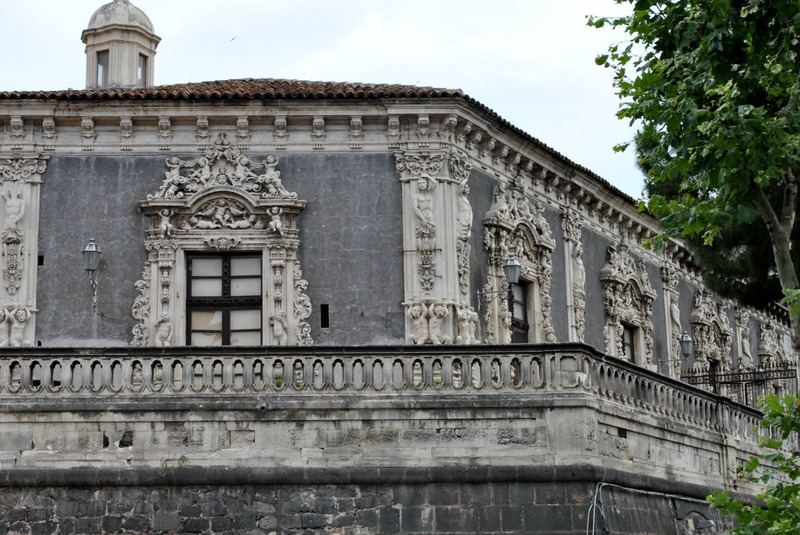 There is such a mix of architecture in Catania, too, some Roman, some Greek, and some Baroque-style. There are also a lot of balconies, many of which are made from traditional hand wrought iron. We also passed a statue of Hades and Persephone. The story of Hades and Persephone is that Hades, god of the Underworld, fell in love with the innocent and beautiful Persephone, and wanted her to be his bride. 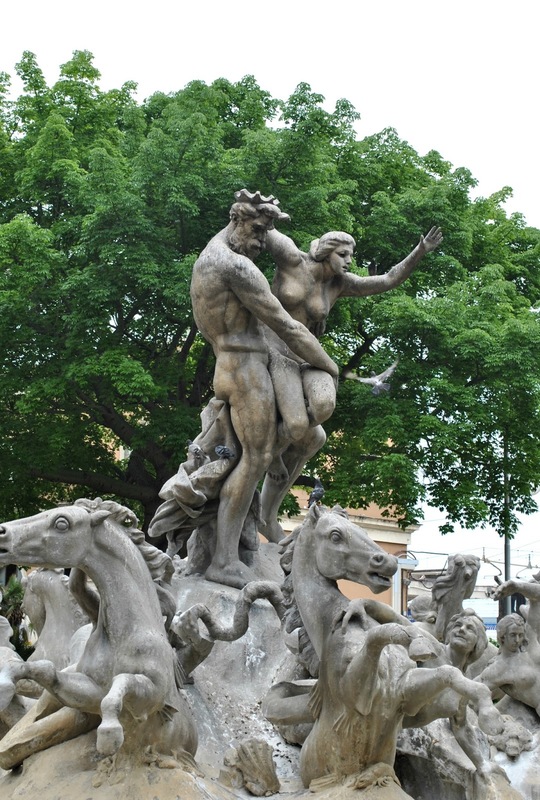 However, Persephone did not want to live in the Underworld, and so Hades had no choice but to capture her by scooping her up from a Sicilian plain and taking her down to the Underworld in a horse-led chariot, which is what the statue depicts. Although I'd read a little into Greek mythology a few years ago after a trip to Rhodes, I had no idea that some of the stories took place in Italy, let alone Sicily. Later on in the trip we heard about another well-known myth that is said to have taken place in Sicily, but I'll get to that in a couple of post's time. 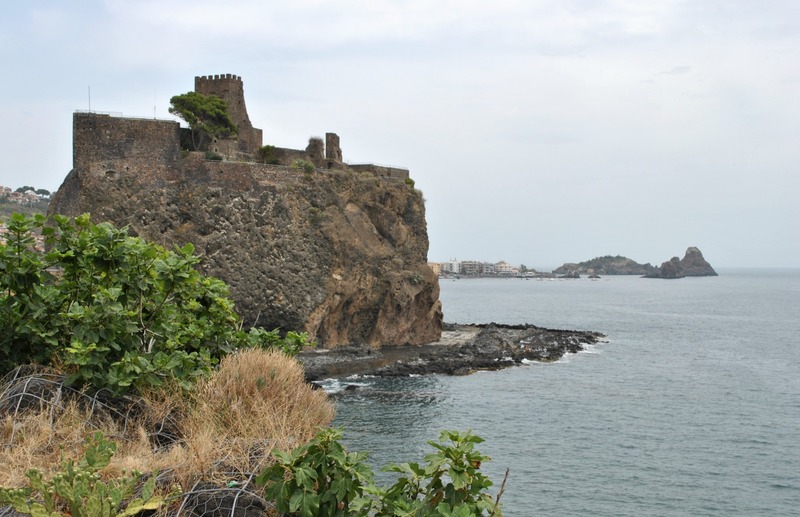 We carried on North towards Aci Castello, stopping to look at the Norman castle built there. The castle used to be separate from the mainland, but the lava from one of Etna's eruptions joined the base it's built on to the mainland. The beaches in this part of Catania are made up of black volcanic rocks, much like the Cyclops Rocks nearby. 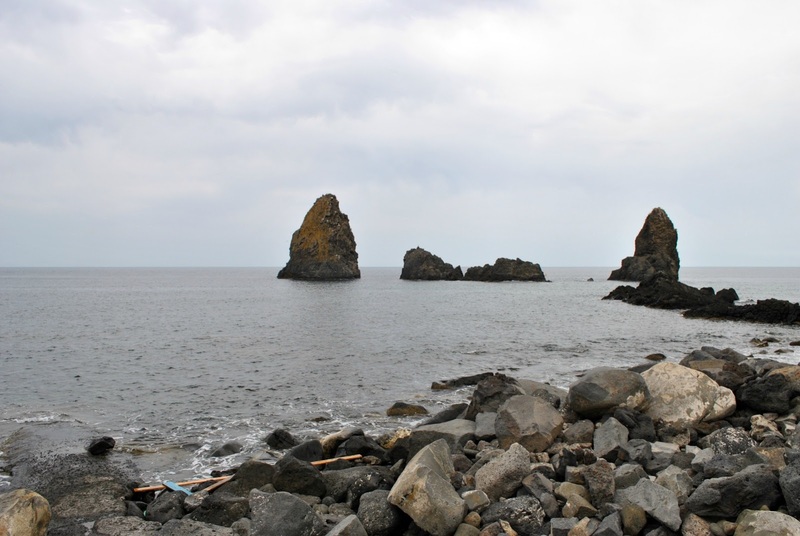 According to Greek and Roman myths, these volcanic rocks are the ones that Polyphemus ripped from Mount Etna and threw at Ulysses during their fight. It was quite an overcast afternoon which only made the black rocks stand out more against the blue-grey horizon, and it was lovely to stop for five minutes and take in the scenery whilst letting the sea breeze cool us down. The bus dropped us back in the Piazza, so after wandering around for a while looking for somewhere to eat, we decided to head back to the apartment and cool down a bit first. Once we felt a bit fresher, we went back to the smaller square and went to 'Mini Pizza' - the boy had a calzone and I had a salad. I'll admit it wasn't the best salad I've ever had, but it filled a gap. We then went back to the apartment again to relax some more, and since we were feeling quite lazy, we ended up grabbing a couple of little €1 pizzas from one of the nearby shops and eating them in the apartment, talking about the sights we'd seen.